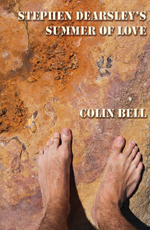 Colin Bell's Stephen Dearsley's Summer of Love is on the [Polari] longlist and I do hope it makes it to the next stage. It also cuts across time as the young fogey Stephen, who is uptight, and upright, finds love, drugs and the facts about the mysterious Austin Randolph whose biography he has been commissioned to write ... The form of the book is alternating chapters of time and characters, that gather together to create a whole picture of various times and lives. Randolph proves to have been one of Oswald Mosley's Blackshirts, yet a highly charismatic figure who everyone, including his own half brother, was in love with and lusted for. Stephen's summer of love in Brighton is well observed. Colin Bell was born in a Franciscan convent in Surrey but grew up in Sussex – everything that he has done, he did for the first time in Brighton. After half a lifetime in Manchester working for Granada Television, he returned to Sussex and now lives in Lewes, the urban equivalent of BBC Radio Four. At Granada, after working in every department from politics to light entertainment, he became a producer-director of arts documentaries and then Executive Producer , Music and Arts, making arts series for ITV and Channel Four. His television credits include Celebration, God Bless America, My Generation, Menuhin's Children and It Was Twenty Years Ago Today. He has fond TV memories of writing scripts for Kenneth Williams, unwittingly asking Sir Lawrence Olivier to find him a transistor radio, being the regular voice of ‘sneering authority’ on the investigative journalism series World In Action and setting the music questions for University Challenge. He is also proud of writing three children's books (published by Novello's) to accompany the Early Reading series, Story World and of working with most British rock bands from The Beatles to Oasis. Following an urge that would never go away, he gave up television deciding that he had to try to become a full-time writer and thus fulfill his life's ambition. While working on his novel and a number of short stories, he suffered a brain haemorrhage that was meant to kill him but failed. Described as the neurologist's ‘miracle patient’, he made a full recovery while discovering the virtual world of Second Life and a previously unexpected ability to write poetry. He adopted a wolf's persona when his cyber name, Wolfgang, was affectionately lengthened to wolfiewolfgang during his time as arts editor of the online men's fitness magazine Mansized, and he still answers to the name Wolfie in various writers' communities, in Second Life, and on his web site where he writes a daily blog. His poetry has been published in the UK and the USA by The Blotter, The Fib Review, Every Day Poets and Inspired Words. His short stories have been performed by the White Rabbit theatre company in London and published by Ether Books. He is a Writers' Village Best Writers' Award winner and has given poetry readings in the UK and the USA. He is an enthusiastic but skilless martial artist (Kung fu and Tai chi), roller-blader and musician who relaxes in his small town garden with a very sharp pair of secateurs and where he is not afraid of barefoot snail crushing.